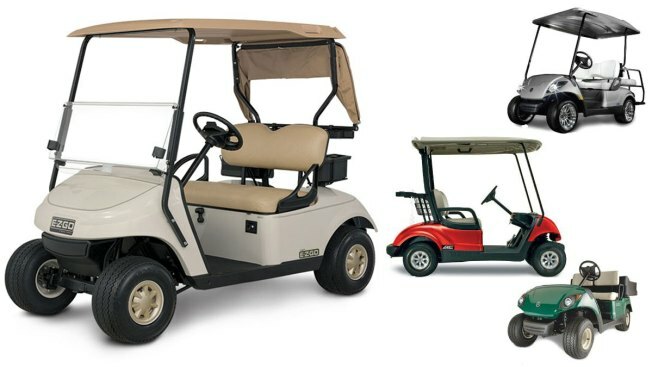 These are generic images of golf carts, not the ones the young people allegedly used. Police say five young people used golf carts to play bumper cars at an upstate New York golf course, causing several thousand dollars in damage. Officials tell The Daily Gazette of Schenectady that the suspects entered the cart storage building at Amsterdam Municipal Golf Course on Sept. 22 and took five carts out onto the golf course. Police say the suspects then started crashing the carts into one another, causing more than $7,000 in damage. Officials in Amsterdam, 30 miles northwest of Albany, announced the arrests Thursday. They've charged three men ages 18, 19 and 29 and two 17-year-olds with criminal trespass and criminal mischief. All five were issued appearance tickets to appear in Amsterdam City Court at a later date.